Groom Energy’s Jon Guerster traveled to Lightfair 2014 to uncover the latest and greatest trends in LEDs. This year we flew the whole Groom Energy field engineering team to Las Vegas for Lightfair, the annual lighting industry show. While Vegas is a fun location for our team meeting, our real plan was to conduct an LED scavenger hunt, sending our engineers into Lightfair’s exhibit hall filled with 500-plus vendors to search for the latest, coolest LED lighting technologies. LEDs have since become the industry’s iPhone, offering near-universal awareness, third-generation apps, innovation and coolness. The products have advanced dramatically since our first Commercial and Industrial LED Research Report was published in 2010, with some now at a third of their original cost, twice the performance, higher CRI and offering ten-year warranties. Last year’s Lightfair was about advancements in LED color quality, intelligent control and fixture type adoption. This year, we armed our 30 engineers with lists of “must sees” and “nice to sees” and expected they would also uncover some unexpecteds. The morning after our hunt, the team met to debrief. Scary to say, but Lightfair has actually become a bit more ho-hum. Oh yes, there were lots of new things. But after several years of new product intros, higher lumen/watt performance milestones and plunging prices, the LED market has become more like the traditional lighting world it so quickly supplanted. It’s no longer if, but when, LEDs will take over, and senior managers face no career risk by adopting the technology. Like the years pre-iPhone, Lightfair has gone back to being dominated by big brand announcements (Philips, GE, Cree, Sylvania and Lithonia), with big crowds forming around their booths. We did see a gathering at the GigaTera booth, but it turned out that one of its LED fixtures had caught on fire. The area known as "Chinatown,” which five years ago hosted no-name manufacturers offering crude first-generation versions of LEDs, has disappeared, moving onto the exhibit floor as private-label knock-off products offered by bigger brands. So what did our team bring back that they saw as new and interesting? Controls: WattStopper, Daintree and Digital Lumens all showed their latest control advancements, with a continuing theme of offering smaller, cheaper, and modular options, plus more features for controlling and measuring energy savings activities. Form factors have gone from $60 six-inch wired bricks to $10 one-inch plug-in chips in just one year. Acuity, CREE and GE also had “intelligent” control announcements. Legacy manufacturers turn LED: A newly supported global standard for LED modules, Zhaga, now allows fixture manufacturers to easily convert their fluorescent and HID fixtures into LED, using simple LED modules from name-brand companies like Philips, Sylvania and LG. These modules now have standardized power inputs, screw patterns and lumen outputs. One of our engineers even found an LED version of an HID fixture that had been tuned to produce the original obnoxious yellow high-pressure sodium light output. LED fixture retrofits: Like the module conversions, the market is transitioning from replacing entire lighting fixtures with their LED equivalents to retrofitting existing fixtures with new LED guts. This approach lowers costs further, driving better paybacks while mitigating employee reactions to a new fixture’s different look and feel in the workplace. These retrofits can be performed quietly at night, without anyone even knowing it happened -- but the utility bill and lighting maintenance budgets get a big benefit. LED T8: One of our 2010 market predictions was dead wrong. As engineers, we pontificated that heat dissipation challenges would ultimately prevent LEDs from replacing fluorescent T8 lamps with LED versions in the same form factors. 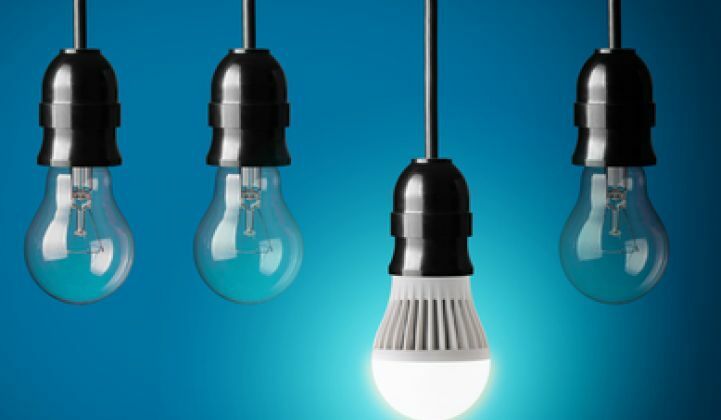 In 2011 the DOE put out a technical study which showed that performance and price were still not there, with one of the “best-in-class” LED products costing $120 per lamp. Today a T8 fluorescent only costs $2 to $5, depending on volume. Wow, did we miss that one. LED T8 has arrived and is being offered by the market’s most reputable players. A few weeks ago, CREE introduced its own T8 LED, announcing the LED T8 Series. Philips did the same thing earlier this year with its InstantFit product. Not too far behind, GE showed off its yet-to-be-released LED T8 product as well. While these lamps are still $20 to $40, utility rebates are supporting many of these upgrades, and long-run-hour applications can hit fast paybacks. The key to these newest lamps is that the replacement is a simple swap-out with the existing fluorescent lamp, no rewiring necessary. First and second versions had required bypassing the existing ballast, or installing a separate driver, both adding electrical labor cost to each replacement. Sylvania’s UltraLED currently has this challenge, but don’t be surprised when its next version comes as a twist-in. Jon Guerster is CEO of Groom Energy Solutions. A version of this piece was originally published at Groom's blog and was reprinted with permission.